Wirralgate: Council claim they’ve got it taped! It was here that we compared the case to Watergate case and the disgrace of US President Richard Nixon. 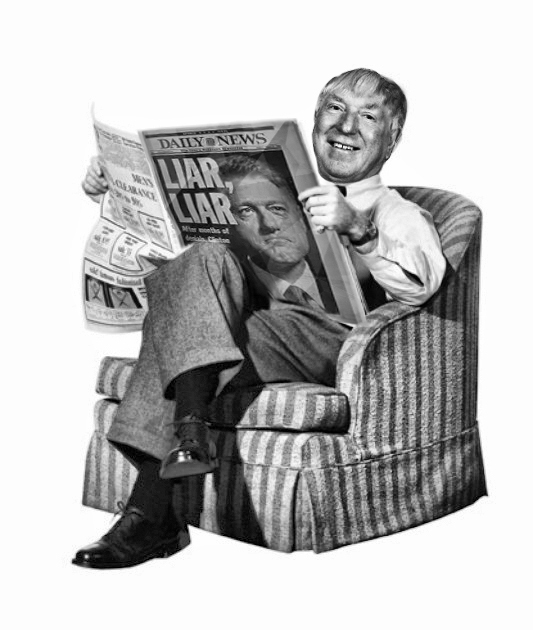 Now with the publication of an independent report of monumental , almost pathological , denial we are minded to recall another US President , infamous dress messer , Bill Clinton and his ” I did not have sexual relations with that woman” claim. The flimsy report of consultant Patricia “Thick &” Thynne which selectively focuses on allegations of a smear campaign against Tory Leader Jeff “Jefferson” Green is simply beyond satire. On this matter we can only agree with Ms.Thynne – what is needed at Wirral Council is not an investigation but fumigation. If the contents of the audiotapes are ever released it will be interesting to observe as to whether some of the statements made in the report will mean that certain Councillors and officers will , like Bill Clinton , er, come unstuck…………. There has been local consternation that a circus has recently set up camp on Wirral which features live animals. There appears to be some dismay that the council should have intervened and put a stop to it. To which we can only say that considering that Wirral Council have a chequered past when it comes to the treatment and welfare of vulnerable people that it was highly unlikely that the treatment and welfare of animals should concern them. Moreover we think circuses and Wirral Council have a natural affinity as jugglers,illusionists and clowns appear to be responsible for running the show. As our follow up to our Lessons Have Been Adjourned story just to let you know that the Audit & Risk Management meeting has gone from being reconvened for this week to tba (to be arranged) / cba ( can’t be arsed) to now being held October. “Yes but did they specify October of which year ” sniped Her Ladyship. This decision was taken backstage by Councillors and carefully concealed from public scrutiny after what a number of sources describe as “bullying”. “Plus ça change, plus c’est la même chose…” sighed Her Ladyship. Now we know it’s a big report but are Councillors hoping that they can pull the traditional “Star Wars Card” out of the pack and claim the shenanigans all happened “a long time ago in a galaxy far,far away” ?. As a public service to assist Councillors with their deliberations Miss Snoop has applied her forensic skills to the report and we will be publishing ” BIG/ISUS For Dummies” shortly. We understand that Lib Dem Councillor Stuart Kelly has called in a Council decision concerning cuts to funding of projects in other departments as a result of yet another Department of Social Services (DASS) projected big overspend. Although it must be said that the Council cabinet minutes are an absolute masterclass in obfusaction so it becomes a case of when is a £3 million projected overspend not a £3 million projected overspend?. The minutes record that DASS Director Graham “Son of Bill” Hodgkinson “set out that there was a projected potential budget variance reported on behalf of Adult Social care in the finance report of £3M . The figure of £3M that had been reported was not as yet an overspend. It was derived primarily from a financial perspective that all of the benefits of the projects may not be deliverable in year”. And so it’s a case of robbing Peter to pay DASS to reduce the projected overspend which Cllr.Kelly (and other Councillors) have objected to. At least DASS should be congratulated in ‘fessing up and not rolling over the toxic debt into the next financial year and the one after that and the one after that etc; etc; as low friends in high places allowed them to do for many years. Talking of which and finally ………. News filters through of a recent incident involving a high ranking civic dignitary and their companion who were involved in a very public “difference of opinion” when seemingly “tired and emotional” after a civic reception. We understand that conduct unbecoming of people of such high standing has been the talk of Hurst’s Bakery and Houlihans……. In what is turning out to be a longer and more complicated story than “War & Peace” the anticipated conclusion of the BIG/ISUS/Working Neighbourhoods whistleblow came to a shuddering halt at Tuesdays Audit & Risk Management Committee with the (surprise! surprise!) adjournment of another stage managed meeting. Consequently we had a pull a story containing a statement from whistle-blower Nigel “Highbrow” Hobro as we didn’t want to steal his thunder for the reconvened meeting next week. Of course the latter Councillors can rightly claim that receiving such a hefty tome late in the day compromised their ability to ask any pertinent questions whilst Council Officers counter-claimed they complied with Committee requirements because they had previously published a Chief Executive’s report ghost-written for Comrade Burgesski so that should suffice and can we just move on to the bit where we get the trusty “No Case To Answer” stamp out now please and we can all trot off on our summer holidays.Thank you and goodnight. The point that such short-cuts in scrutiny and lack of attention to detail is exactly what has led to all the whistleblowing cases that have beset Wirral Council in recent years was seemingly lost on everyone. Meanwhile our faithful factotum Verity Snoop is wading through the reports pack now and judging by the sighs and gasps and snorts of derision it’s a case of yet more damning reports leading to catastrophic results…………..but only for the whistle-blowers !!!! 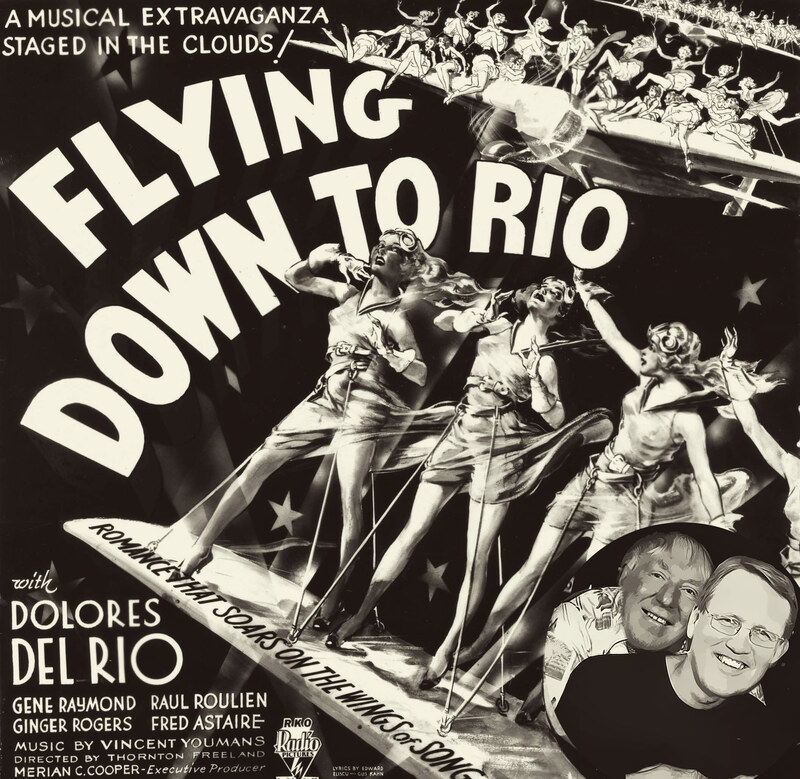 As you know from time to time we like to take a trip down memory lane (or more accurately nightmare alley) and keep up with ex-Wirral Council alumni. Today’s subject is serial cheque-trouserer Bill “Spiny” Norman – who left behind a trail of devastation at Torbay and Wirral Councils and now finds himself suitably ensconced in cider country. Clearly from reading the reports in the press and blogs in Hereford Mr.Norman is proving to be as popular with the local populace as he was with Foulkesy. However we’d like to draw our readers attention to what must be one of the finest commentaries ever committed to a local blog (other than our own). The writer clearly models his writing style on Monty Python characters Doug and Dinsdale Piranha and employed a combination of “violence and sarcasm” but somehow it sums up the frustration and anger felt by many people fed up to the back teeth of town hall tyrants plundering the public purse and imposing their will on local people by means of abusing their power. Bobby 47 (whoever you are) – we salute you! “It’s bloody desperate isn’t it! How the bloody hell do ‘we’ ever deflate this ballon of wealth and rid ourselves of these bottom feeding tics who feast upon our public funds. There’s no bloody end to it. One pile of rubbish falls and another springs up in its place. It’s bloody relentless. Why can’t the Council elected leaders say, ‘No’. Why? I’d have no problem in telling them all to clear off, be gone, on your way and you’ll get no gagging money from me because I couldn’t care less who you tell. Go tell the world for all I care. I couldn’t care bloody less. Why has it got to be this way? Bloody hell! I bloody hate them. I do. Bloody intensely. I hate them more than any of you. Oh, you might think you hate them but compared to me, you simply dislike them. I bloody hate them. I’d love to fix up a fight with Bill bloody Norman. Just him and me. I’d tip up outside Plough bloody Lane, park me handcart and its load of rancid melons and I’d fight him. I would. And he could arm himself with any offensive weapon of his choice, it would be of no concern to me and of little use to him. I’d bloody hurtle toward him screaming and gibbering in biblical tongues and frighten the life out of him howling, ‘Bill. I bloody hate you and today I’m going to punch you once for every pound you’ve managed to take from the public purse’. That’d make him think, ‘Good Lord that’s a lot of punching’. 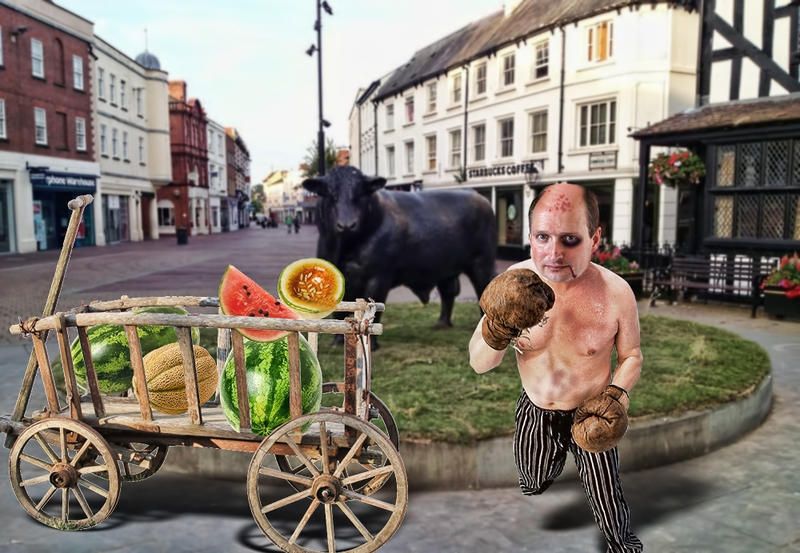 If Bill bloody Norman is reading this, and lets face it, its highly unlikely I want him to agree to fight me so that I can deliver Hereford from his controlling grip that sees him and his colleagues getting wealthier and us getting bloody poorer. I’ve said it before and I’ll say it again, not that its worth repeating, Council staff have got to start leaving their work stations, knocking on the doors of the high and the bloody mighty and asking them out for a fight. That’d sort them all out. Imagine going to work everyday knowing that you had to fight the staff. They’d soon get tired of that. I know I would! If I had to fight the staff daily I’d be looking to work elsewhere at some place where I didn’t have to fight the staff. Before I agreed to take up the position of Head of Legal Services on a salary of an eye watering sum of money I’d ask, ‘do I have to fight the staff’. The right honourable Lord & Lady left strict instructions that in their absence I pay tribute to Wirral’s First Citizen on the opening day of the Open golf championships , where no doubt “Mayor” Foulkesy and his consort the Lovely Elaine will be courted and feted in the corporate hospitality tents. 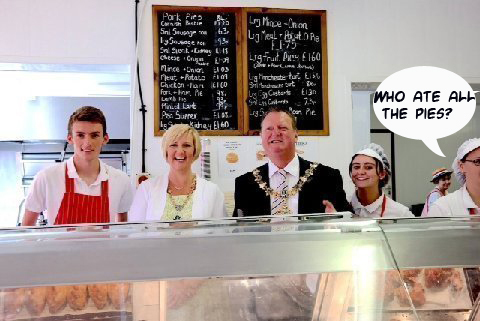 Therefore I have to thank Wirral Leakers for sending in a delightful picture of Mayor Foulksey at a previous public engagement. I’d also like to thank them for their suggested captions which somehow encapsulate the reverence and respect that this great man seems to engender wherever he goes. Oops! DASS Did It Again! With the Lord and Ladyship away on their summer sojourn, it is I,Verity who has been left to hold the fort or more accurately the Towers! And no sooner had I bid a fond farewell to our esteemed entourage than another exclusive lands in the Wirral Leaks inbox. Remember when Wirral Leaks exclusively revealed that unfortunate incident when a gullible Wirral Council employee was duped into parting with £45,000 to a fraudster claiming to be a care home owner? I say this as it would appear the Department of Adult Social Services (DASS) are not unlike Britney Spears with OCD. “Imagine if someone from WBC had accidentally emailed a breakdown of every care home and vacancy. Imagine if this spreadsheet was disclosing sensitive commercial information including confidential information about homes which there are issues with and not placing with etc. Imagine if this information was accidentally emailed to EVERY care home. Imagine that WBC had previously refused to part with this information due to its commercially sensitive nature and providing a market statement. Imagine if providers look at their own information – its not even accurate. Well at Leaky Towers I don’t have to imagine as I have the evidence of the malpractice right here before me. At last! 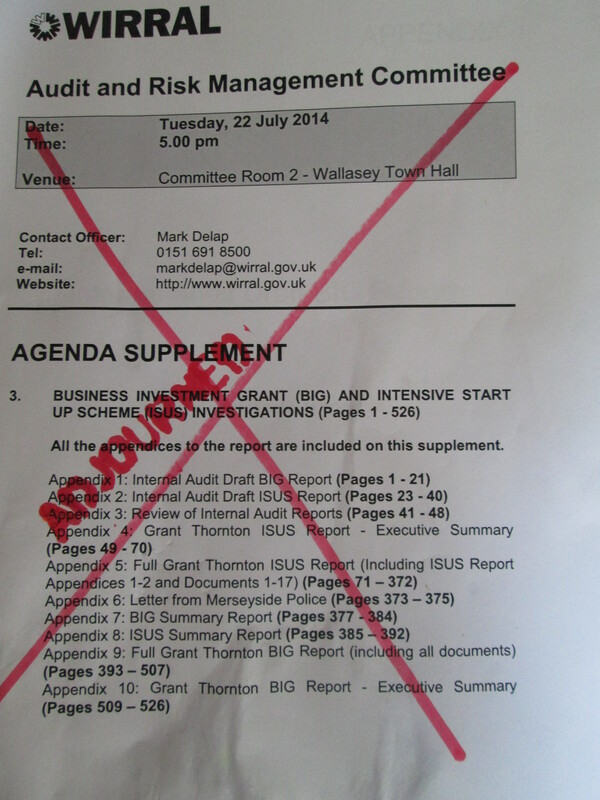 the event that Wirral has been holding it’s breath for……no,not the release of the Wirralgate tapes! 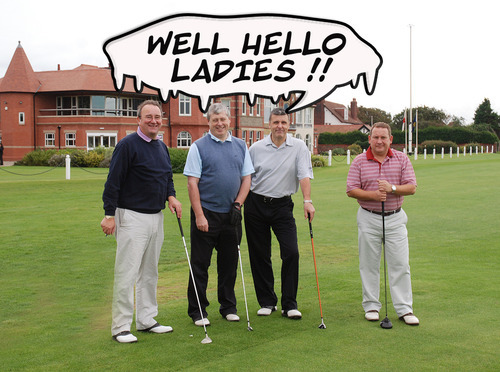 It’s The Open golf thingy starting in Hoylake this week. 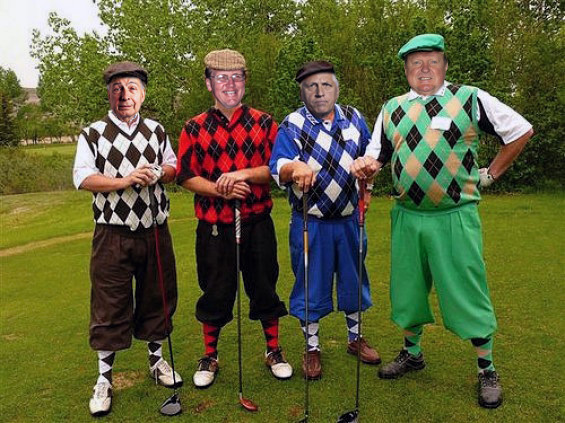 Needless to say to avoid the hordes the Wirral Leaks entourage will be heading down to our villa in the South of France for the duration of the tournament. We’ve hired out Leaky Towers for an obscene amount of money , which is entirely in keeping with our champagne socialist principles and also means we can pay for the roof repairs in the west wing. In our absence we are asking you lovely people to keep us updated on local events and request that you enter the Wirral Leaks Photo Competition! Our man in the fedora and the dirty raincoat will be there with his trusty telephoto lens but we’d like to see some of those jolly informal snaps so beloved of this blog which show local dignitaries enjoying the privileges of high office. 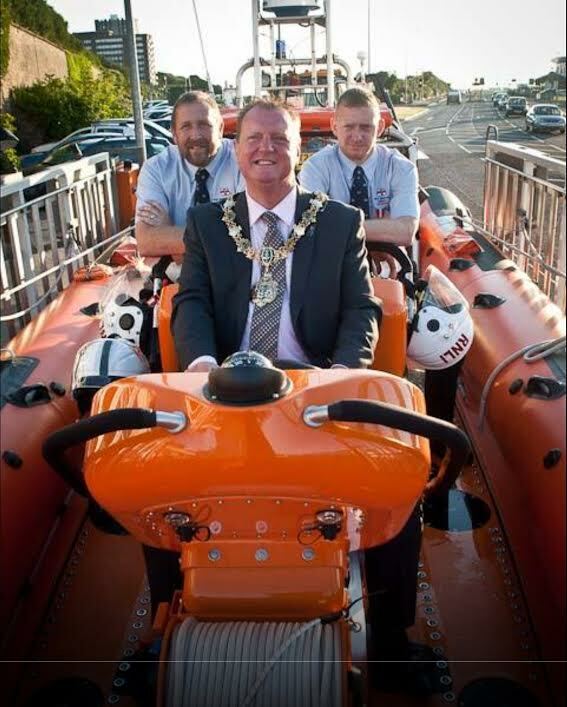 We’d particularly welcome any sightings of former Wirral Council Chief Executive Steve “Freedom of the Borough” Maddox (see above) and any information relating to this particular Freedom of Information request. 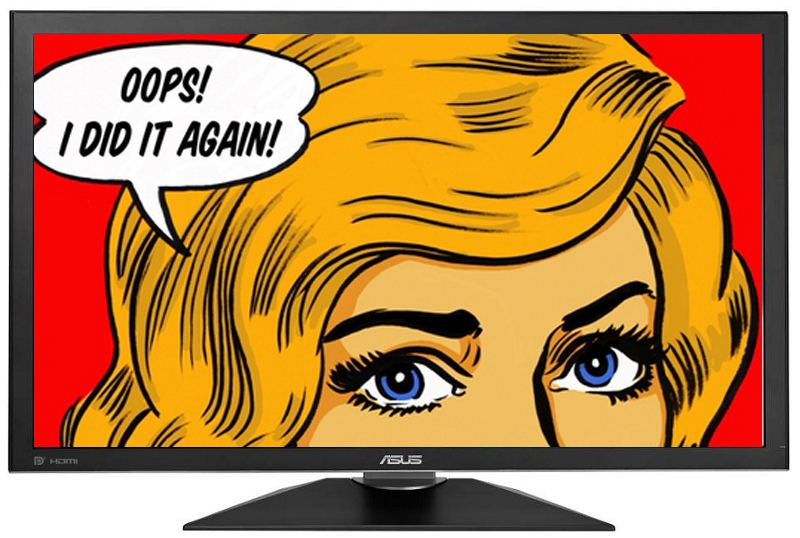 ***… leaving a sinking ship? Today we raise a glass and send our fraternal felicitations to fellow feather -rufflers and local bloggers Paul Cardin and John Brace. 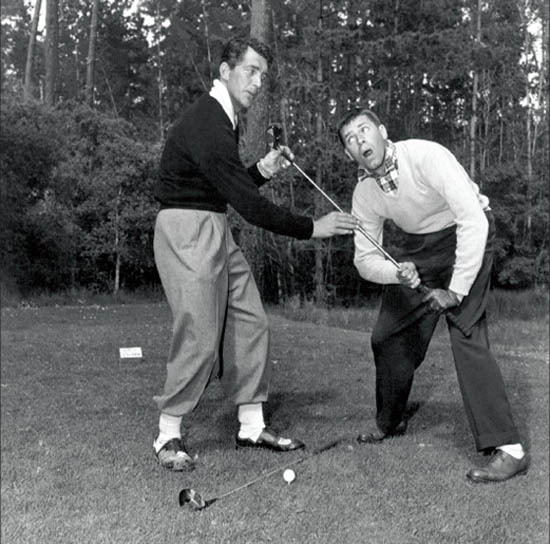 Subsequently Mr.Brace was sent an email titled “Fraudulent Email” by Tour following the publication on his blog of correspondence sent by Comrade Burgesski providing details of the upcoming Open golf beano. Now can we offer Mr.Tour some advice (pro bono , of course) and humbly suggest that when it comes to vexatiousness and the leaking of confidential correspondence that he looks much, MUCH closer to home. 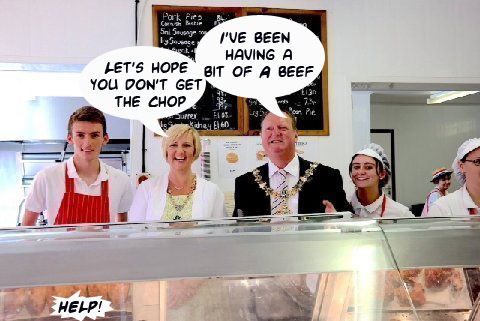 as he provides a transcript of a recent Roger Phillips Radio Merseyside programme where local caller (Paul from New Brighton) raises the issue of the grace and favour hospitality to be enjoyed by the local political and business elite at the Open golf championships. 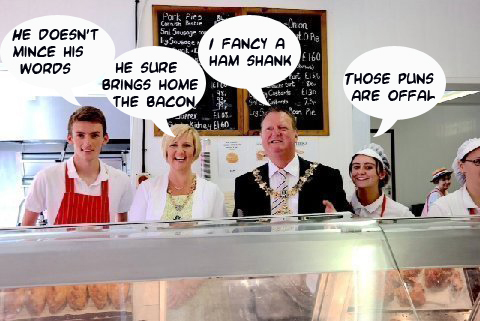 Then up pops Councillor Walter “Wally” Smith to deny such claims before disclosing he has indeed enjoyed “lavish hospitality” not because he is a Councillor – oh,no,no,no – but because he’s run up a few pair of kecks for a local hotelier. Forgive us for being underwhelmed by such principled self-sacrifice!. Whatever possessed Smith to think that a piss up on the public purse was ever appropriate in the first place ! Talking of the Mayor and ,ahem, drinks – we note that the Council are being particularly coy about releasing the costs of Foulkesy’s Mayor-making ceremony and ,we presume the bar bill in particular, which we suspect will be eye-watering. Despite protestations to the contrary “Destination Wirral” appears to be a bid by Wirral Council to turn the peninsula into one great big golf course. Of course “Destination Wirral” is not to be confused with “Destination Excellence” (stop sniggering) the monumental Foulkesy fail that followed the publication of Klonowski’s Independent Review. Remember how we laughed as Foulkesy promised to adhere to the recommendations of the Independent Review and the Corporate Governance Report that preceded it, with “bible-like” devotion? However this latest feeble branding exercise at least has the benefit of a “Destination Manager” (which sounds like a Council rebranding of Foulkesy’s mayoral chauffeur). Now please forgive us but when were Ellesmere Port or Whitby annexed by Wirral? and why would Wirral Council give money to venues to hold a Wirral Folk Festival there? It has been suggested to us that this enables Wirral Council managers to tick a box in the pursuit of European Union funny money (European Regional Development Fund to be specific) We can only ask ourselves whether chasing the Euro will herald the return of “Eurowirral” ? – anyone remember that risible branding exercise undertaken by the Council ? However it strikes us that if the Council were really serious about Wirral being a “destination” rather than a “deviation” that it would help if there was a Tourist Information Centre rather than relying on the likes Royal & Ancient website plugging hotel accommodation for the upcoming Open golf championships mainly out Chester way because nobody knows where “Wirral” actually is!………. Meanwhile the Council’s obsession with golf continues unabated with news of them “consulting” about the flogging off of municipal golf courses. Except Hoylake of course ! 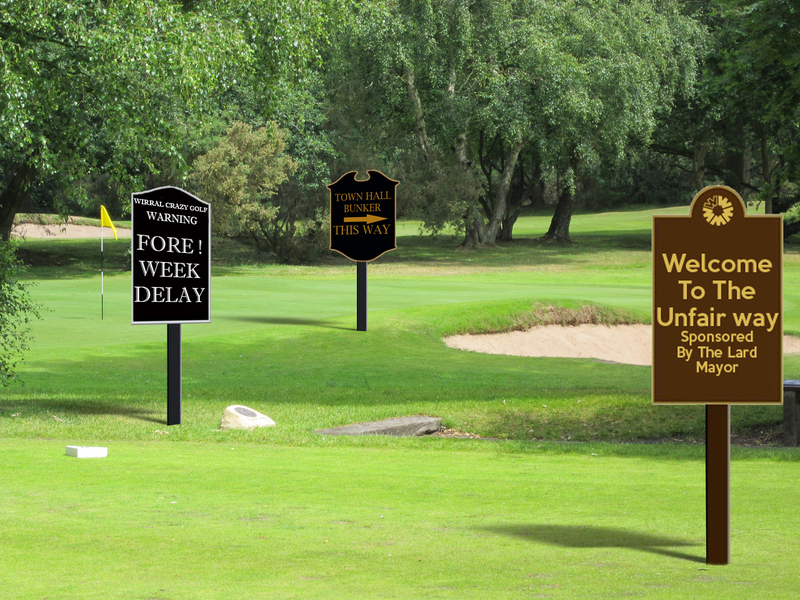 – could this have anything to do with the postponed announcement mooted for the opening day of the Open when the Council planned to unveil the Last of the International Playboys funding partner they had lined up to thrill us all with news of a luxury golf resort coming to Wirral? 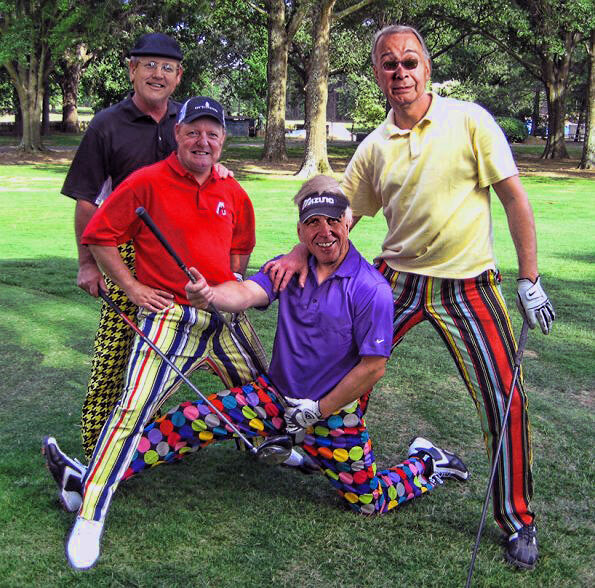 Needless to say the momentous event went the way of all Wirral Council drives down the fairway – in the rough and unplayable. Therefore we can’t help wondering whether this golf resort proposal doesn’t end up being Stella Shiu 2 and like the Wirral Waters project permanently lodged in a sandtrap.